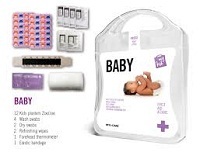 First on the spot with an accident, our Customised Baby & Toddler First Aid Kits are the first line of safety with your Company branding and artwork on full display. Gain valuable and positive advertising with a considerate business gift for parents, nurserys and the healthcare profession. Hand out at trade shows, public events or directly to the customer - your fully customised baby first aid kits gain both brand-name recognition and reciprocation for your Company! For a FREE QUOTE, please fill in the form regarding our Customised Baby & Toddler First Aid Kits and we'll be able to help you.